Here’s an experiment I never thought I’d do — and post I never thought I’d be writing! For over two years, my wife and I planned to have a two-week hiatus from both her job and my research for our 10 year anniversary. We might travel, we might not — all the details aren’t fully worked out. But that’s not really the larger point for us. Following this hiatus, I’ll have the biggest and busiest summer yet with no less than five speaking engagements over just three months! I also plan to expand our CC video library as well to provide better tools for beginners. Moreover, I have a lot of research and study behind-the-scenes that I hope to reveal to you soon. Stay tuned. So needless to say, this hiatus is a kind of calm before the storm. Which led me to an idea. Okay, pretend I truly do have the most wonderful wife in the world. Put yourself in her shoes as I ask, “Hey honey, would you mind if gain a lot of weight on our hiatus? It might help my research tremendously!” Pretty hot, huh? For those first seven and a half months I was on keto I gathered no bloodwork. Did my cholesterol change immediately or take a few months? As I built muscle and dropped adipose mass, were my lipoproteins moving into higher circulation? More to the point, did my LDL cholesterol track upward with my body fat going down on this low carb diet? Those who follow my work know that is this is a common thing I identify as relevant with regard to whether you end up with higher cholesterol. It’s literally the “Lean” part of the Lean Mass Hyper-responder profile. Originally, I felt this was pretty much the one part of my research I wouldn’t be willing to go. Regain the 35lbs I lost just to see what happens with my lipids? C’mon! Nevermind. I guess I’ll continue to surprise myself with what I’m willing to do to get even more quality data. So for the next few weeks, I’m planning to get myself north of 200lbs, preferably 205-210lbs. At 6’3, that will put me at a BMI of 25.6-26.2. And yes, I’m actually shooting more for fat, not muscle. I plan to have a diet high enough in calories that I don’t lose weight too quickly, lest that confound my lipid numbers. I may do a more restrictive meal plan for even better variable isolation, but I’m not committing to that yet. Depending on my existing funds, I may be taking dexa scans throughout as well. Once I’ve dropped down to mid 180s in weight or lower, I’ll do further wide spectrum testing (Lab and CardioChek) to determine if the relative difference is shown post-experiment as well. Let me be very clear about this: I DO NOT recommend anyone else do this. Indeed, in order for me to accomplish this, I’ll be intentionally having large amounts of carbs and fat together, spiking my insulin and attempting to keep it at a higher basal level to ensure greater fat storage. In other words, I’m inducing a certain degree of the very thing I associate with modern western disease: hyperinsulinemia. Obviously, this is a short-term experiment and I don’t consider this a serious enough risk or I wouldn’t do it. But that isn’t to say I think of it as risk-free. I may find it much harder to return to the previous weight and/or body composition. I may build worse health or eating habits than I had before. And as always, there could be any number of other variables I’m not accounting for because I just don’t know about them. I hypothesize that once I’ve returned to the keto diet my relative LDL cholesterol will be lower when compared to my lower weight and less overall adipose mass. The longer explanation for that I’ll leave to my other posts for now. 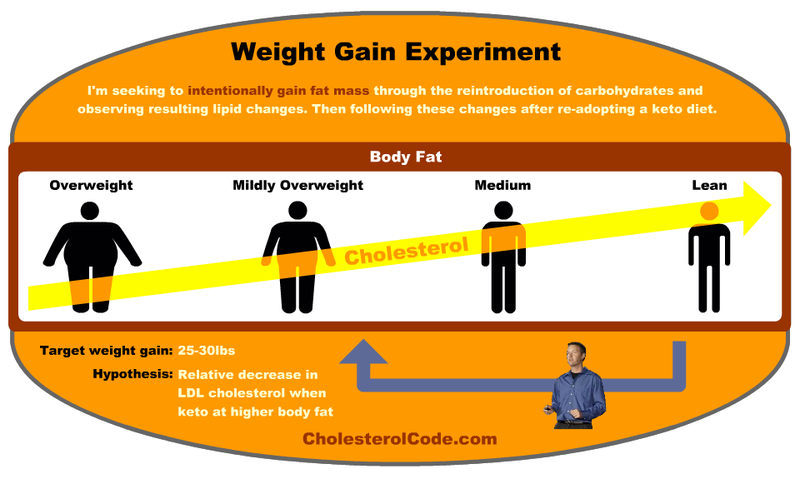 Will you also be taking into consideration exercise in this experiment and keeping that consistent pre and during the keto diet, or will that also be another variable in your experiment? I won’t get getting any exercise beyond lots of walking. I usually average 2.5-3.5 miles a day and I may exceed this during the hiatus. If I have an unusually higher level of walking on any given day, I’ll be making a note of it (I do this already). Your awesome! Exciting reading and following you! Appreciate it, Tim — cheers! Dave, you are now my favorite mouse! Pretty awesome! And best of all, I don’t have a rodent lipid system, so my data is actually kinda relevant compared to these insane mouse models (where they are also often genetically bred/modded as well). I did bloodwork not on Keto and being a lot havier. And cholesterol was much lower. But i’m not willing to follow you in this experiment. My goal is to go the opposite way. From lean (19,8 %bf on dexa) to verry lean(7-10%bf?). And in the proces I will try to do a lot of data collection. I think the results will be the same? Will share if I get there. Will not be in 2 weeks. That’s great! Yes — I’d love to see if your LDL increases *relative* to what the same exact diet showed from your higher BF %. What’s the Dexa scan for? It captures body composition (fat, muscle, etc). So well see how my body changes over the experiment as I gain and then lose weight. It’s Guylaine, I am willing to bet it’s not going to go the way you want… I am exactly where you want to go…. 33% body fat BMI of 25 5ft 9 inches and 55 y old. I seem to respond as a lean hyper responder even though I am not that lean but with decent muscle mass. Being a woman may bring different factors but if we look just at lipids I believe I am were you want to go. My LDL before keto= 108 after keto but minimal weight loss ;( 210 Total Cholesterol went from 191 to 291 HDL from 66 to 64. I would be willing to bet a $100.00 that you would stay a hyper responder even if you gained weight on keto or at least LCHF. I am not sure how you plan to gain the weight (high fat + high carb or just High carb with controlled fat?). I am very impressed with all your experiment. I saw your comments on Twitter with caffeine as cofounding in experiment so will dig on your site because I am curious about that. I should have read more before I wrote my above comment! I am not a hyper responder… But very happy I reread your protocol because I will make sure I stay away from coffee and all coconut products for my next test at the end of May. Quick question? Apo A Apo B is there an ideal ratio? mine Apo A1=1.88 and Apo B100=1,33 ?? – I do believe I’ll still be a HR. But I’m looking for lower LDL *relative* to where I’d have been at the lower weight. And that should be easy enough to show. I am really looking forward to my next blood test! (see what you are doing to us!!) I will definitely do the 3 day protocol but first I will read all your stuff, it’s been a busy time of the year so trying to catch up. No matter what you will win the $100.00… You more than deserve it. I will do the remnant cholesterol on some of my previous good work I have them going back into the end of 80’s and look at the trend. that you did before? Probably not. for years as you had before? Yep — agree with every one of your points. On the plus side, I’d have dexa scans to ensure that (at least, as best I can) I’ll have gained some subq fat, which is the “money fat” I’m seeking to gain for the intervention test. Thank you, Dave, for having the courage to do this. Very helpful for many of us with body fat AND cholesterol issues. On a side note, I’ve found the CardioChek, et al. to be unreliable. Taking multiple samples simultaneously, the readings are +/-10-15%. That is a 20-30% range, which can make a difference in being normal and being diabetic, or being normal and needing statins. Not to pick on CardioChek by brand. I think the same is true of all the small-sample capillary testers. When a family member was in the hospital, we brought 3 glucometers with us, to see which was the accurate one, as their readings were all over the place. We compared each of the 3 to the hospital reading (done with a pro version of Accuchek). We did this several times over a week, and found that the results from the 4 meters were shotgunned all over a +/- 15% range. None was consistent. Lots of noise in those capillary / test strip readings! I wouldn’t be surprised by that margin with CC and quite agree that it isn’t a replacement for a lab draw. Dave, that’s great. Can’t wait to see the results of the keto adaption. I did an 8 week keto adaption experiment and took basic Lipid panels and BHB readings weekly. The thing that jumped out to me was my TRIGs started normal about 120, then immediately began rising up to a peak of 300 in weeks 3-4 (ate same diet the whole time and tracked BHB to verify I was in ketosis) then came back down to 120 by week 7. The TRIGs tracked my BHB levels which I think was showing me the time it took for cells to adapt. When TRIGs were spiking my BHB was also spiking up to 2-3 mmol/L then it came back down to 1 by the end of my expriement. I wish I could share images in the comments to share the plots of the data. I’ll be curious if you see the TRIG bell curve in your keto adaption.